Registration is now open for the 2nd Annual Anishinaabe Racial Justice Conference taking place in the Keweenaw Bay Indian Community (Baraga, MI) May 24-26. You can register here. We hosted our inaugural Anishinaabe Racial Justice Conference in the Keweenaw Bay Indian Community (Baraga, MI) in April 2018. The first conference was a huge success. 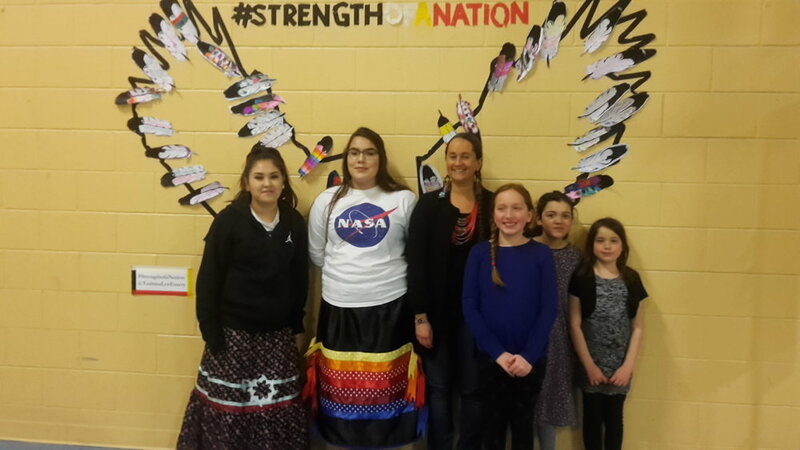 We had 32 speakers and panelists addressed more than 200 participants on topics ranging from environmental racism, mascots, youth voices in racial justice, and storytelling in Anishinaabe culture. Keep in mind that there was a spring snowstorm that covered the entire Great Lakes during this weekend. Despite treacherous weather conditions Anishinaabe people and allies made their way to the conference. Many of our attendees came from tribal communities within a 200 mile radius but we had attendees come from Anishinaabe communities in the lower peninsula of Michigan, Wisconsin, and Minnesota. We also provided a space for walk-in attendees. We had 60 walk-ins during the weekend mostly from the Keweenaw Bay Indian Community. This conference served as a springboard for the work we had planned in 2018. Additionally, it not only served as a safe and supportive space for Anishinaabe people but a place where we can gather to grow this important work. As a result of this conference, we have built new relationships and collaborations across our territory. Learn more about our first conference - First Anishinaabe Racial Justice Conference tackles discussions local and national discrimination. As a form of decolonization, the conference broke free from the standard Western format, by which the Native Justice Coalition elected to not have a keynote speaker and instead weighed the voices of each attendee equally. In Anishinaabe culture, ogemaag (leaders) do not make decisions for their community without a full consensus. We worked in collaboration with the following organizations: Michigan Roundtable for Diversity and Inclusion, Red Circle Consulting, Native Justice Coalition, Northern Michigan University - Center for Native American Studies, Michigan Technological University, Showing Up For Racial Justice - Keweenaw Chapter, and the Keweenaw Bay Indian Community. We believe in creating a safe and supportive space for Anishinaabe people, all people of color, and allies who support our work. Native American people have often and historically been left out of discussions on racial justice in the US. This conference seeks to change this narrative. We seek to center Anishinaabe and all Native American people in racial justice. We have secured 10 partnerships for our 2nd Annual Anishinaabe Racial Justice Conference taking place in May 2019. These partnerships include: Michigan Coalition Against Racism in Sports & Media (statewide), Nokiiwin Tribal Council (Thunder Bay, Ontario), Great Lakes Peace Center - (Rapid River, MI), Showing Up For Racial Justice - Keweenaw Chapter (Houghton, MI), Indigenous Law and Policy Center at the MSU College of Law (East Lansing, MI), Indigenous Peoples' Day Campaign in Michigan's Upper Peninsula (Houghton, MI), Michigan Technological University (Houghton, MI), We The People of Detroit (Detroit, MI), Keweenaw Bay Indian Community (Baraga/L'Anse/Marquette, MI), and the Keweenaw Bay Ojibwa Community College (Baraga/L'Anse, MI). We are engaging with these partners to assist in creating a successful conference. They providing support, feedback, speakers, and linking to additional resources form their respective organizations and communities.